That was me, just me, and only me. I thought that it was a terribly funny sounding name, since Manuel Noriega was a notorious Panamanian dictator and the juxtaposition of his name with a pleasant word like the harmonies made for a nice giggle. 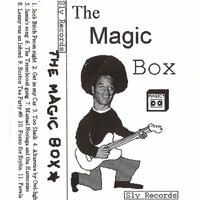 I recorded that song with the Magic Box, which is why it ended up on The Magic Box cassette. I did it at my house one day when my whole family was gone. I kinda rushed through it pretty quickly, I remember writing the "lyrics" the day that I recorded it and there wasn't much meaning or anything behind them. I had always thought of myself as someone who could write and arrange a pretty decent song but couldn't really do the whole lyrics and singing part of it, which is why I basically screamed the words into a microphone that was plugged into a distortion pedal, the MXR Distortion + (that I still have to this day, because it's an awesome pedal, in fact I got that pedal at Old Town Music up in Portland on a trip up there with Matt Fargo at some point while we were still in Lusty 36). It was definitely a one-off type of song. I think it was in between when Lusty 36 had ceased to exist and before I had started the Haltertops with Erik Menteer. So I was trying to write songs and looking for a band to play in.